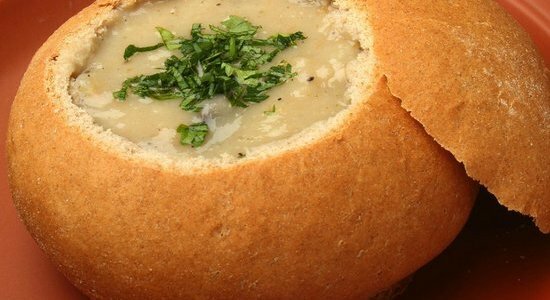 To prepare the bread bowls, cut the breads open horizontally the top, then remove most of the soft bread inside, taking care NOT to make any holes into the bread bowl walls. In a medium saucepan, melt 2 tablespoons of the butter over medium heat and add the onion. Cook until the onion is soft and translucent, then add the mushrooms and the remaining butter. Let the mixture sweat for about 8 minutes, taking care that the onion doesn’t take on any brown color. Stir in the chicken (or vegetable) stock and the parsley and bring to a boil. Immediately reduce the heat and simmer for about an 40 minutes. After that, remove the parsley and discard. Let the soup cool for a few minutes, then using a stick blender, blend at high speed until smooth and creamy. When blended, return the mix to the pot, add cream and season with salt and pepper, and bring up to a simmer again. Add the sherry and pour into prepared bread bowls. Top with fresh chopped parsley and serve immediately. Perfect on a cold Winter evening.